← Cabernet Sauvignon, L’Appel du Vide, Columbia Valley AVA, Washington, USA, 14.3% abv. The land of the tango, Eva Peron and stately Buenos Aires, there’s a lot to Argentina, the world’s 8th largest country. There’s also a lot of wine going on there. Because this is Argentina, you may be forgiven for thinking I’m speaking of Malbec, but this is the homeland of Torrontés. The most widely planted white variety in Argentina, Torrontés makes a Muscat-like, aromatic, dry wine with the best coming from Cafayate, located in the far northeast at only 26 degrees south latitude. Although the region is very close to the equator, it’s also in the foothills of the Andes where it’s cool, so grapes can grow because of the altitude. And grow they do – at 1700 or even 1800 m, these are some of the world’s most elevated vineyards. The best versions aim to keep the yields low; this one is also grown using biodynamic principles. 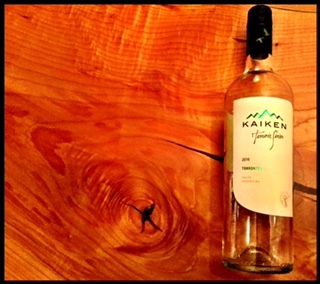 Pale lemon with green hues, the Kaiken has distinctive aromas of blossom, tropical citrus and almond . The palate is dry and juicy with flavours of lychee, yellow grapefruit, white flower and a touch of fennel. Your salad and grilled chicken or fish will love this wine. That should be no surprise considering the importance of BBQ, or asado, in Argentine cuisine. Drink now and don’t age. Add Torrontés to your ‘to do’ drinking list starting with this WSET Good option. This entry was posted in Argentina, Torrontes, WHITE and tagged 12.5% abv, argentina, biodynamic, Kaiken, Salta, Torrontes, white wine. Bookmark the permalink.